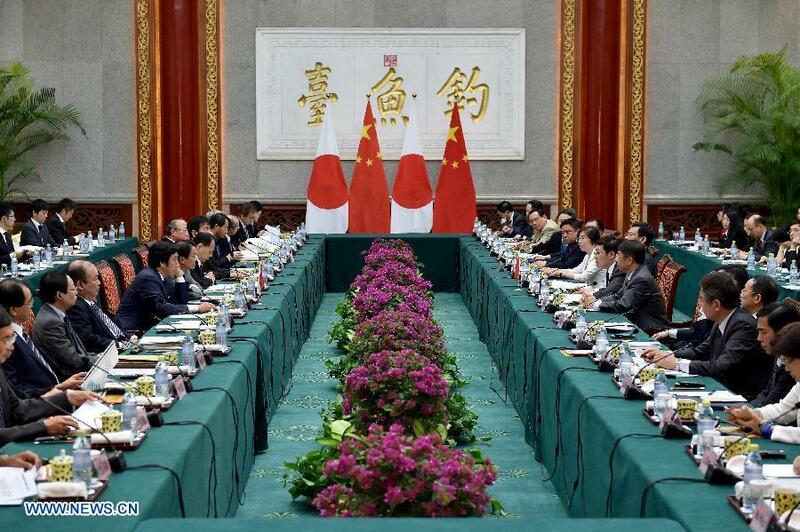 BEIJING, June 6 (Xinhua) -- The Fifth China-JapanFinance Dialogue was held in Beijing on Saturday after about two years of delay due to sour relations. Chinese Finance Minister Lou Jiwei talked with Japanese Deputy Prime Minister and Finance Minister Taro Aso over cooperation in economic, financial and international affairs. The fourth dialogue was held in Tokyo in April 2012. But rows and friction delayed the fifth scheduled for 2013 in China. "The ministers shared the common view that the Dialogue is of important significance for both sides, which contributes to deepening exchange of macroeconomic situation and policy measures of the two countries, strengthening financial cooperation, and hence helping further advance China-Japan strategic and mutually beneficial relationship in the economic and financial fields," said a statement released after the dialogue. Both sides said they are committed to deepening communication and coordination of macroeconomic policies, strengthening communication and cooperation in dealing with external risks and uncertainties, and maintaining consultation on major international economic and financial issues. The two ministers emphasized the need to further deepen bilateral pragmatic cooperation in finance, enhance policy communication in budget, taxation, social security reform, public debt management and tariff, scale up financial cooperation and support collaboration in the economic, trade and investment fields. China and Japan agreed to strengthen cooperation in the G20 to actively implement previous summits' consensus, and push for new achievements in the Antalya Summit in 2015. As two major countries in Asia, both sides pledged to further advancing financial cooperation in East Asia and discussed the direction for the future development of ASEAN+3 financial cooperation. The two sides will promote infrastructure development in Asia, including through coordination with development financial institutions, on the basis of common interests. Lou and Aso agreed to hold the Sixth China-Japan Finance Dialogue in Tokyo next year.